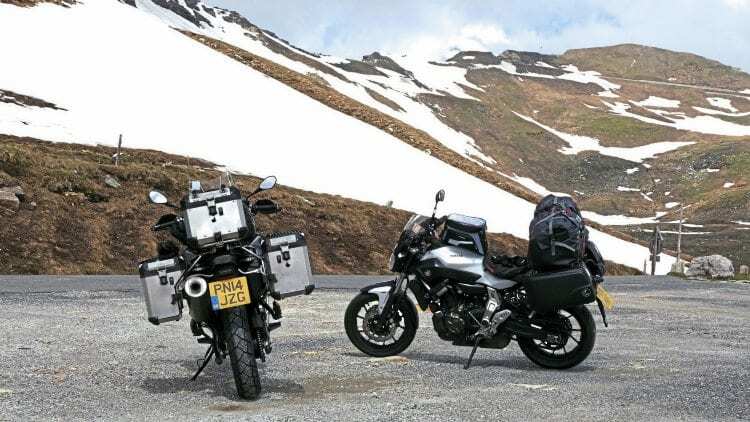 Forty years ago, Steve Pighills toured the Eastern Alps by Triumph Spitfire – this time he rode an MT-07. When you pass 70 it’s a good policy to concentrate on doing things, rather than finding a justification for lethargy. In my case, it was the excuse for exploring the Eastern Alps – Austria, Slovenia and Italy – making it early June and theoretically warmer with less rain. My friend Geoff; who joined me on the trip, and I live in Cumbia, so the Hull ferry is a pleasant 135-mile ride across country, far preferable to the long motorway trek to other ports. My Yamaha MT-07 looked a bit buried under its Hepco & Becker panniers, an 80 litre Givi waterproof bag and a large Yamaha tank bag, though that means it can safely carry a tent, sleeping bag, and all the other necessities for a fortnight away. And I do like the Hepco & Beckers – the Lock-It system means you can remove the frames as well as the panniers. Mind you, Geoff’s BMW GS800 Adventure didn’t look buried at all. 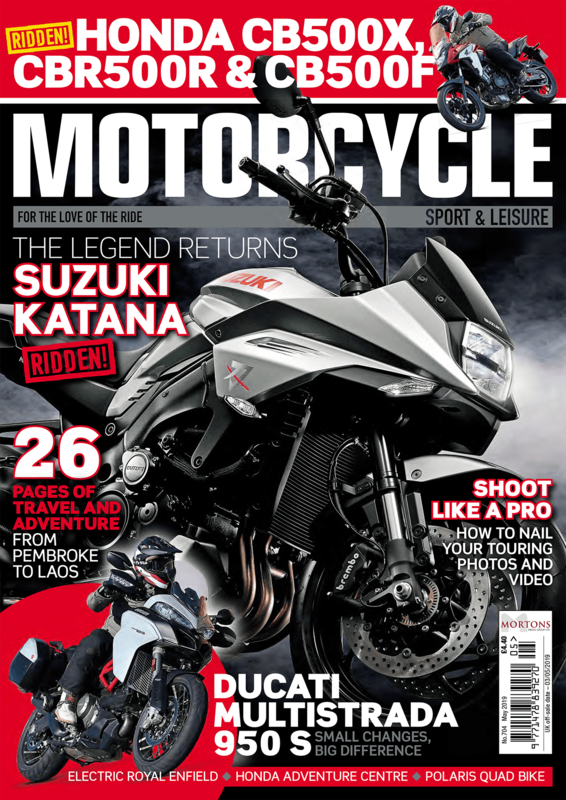 MT-07 was dwarfed by its luggage – the GS800 wasn’t. Monday morning, and we were off the ferry at 9.30am and onto the A15 for a series of autobahns to our first stop, Wurzburg, and a small campsite at nearby Estenfeld. Geoff is used to travelling vast distances in Europe and North America, but for me 400 miles was the furthest I’d ridden in a day for a long time – I was very happy to be pain and stress-free. 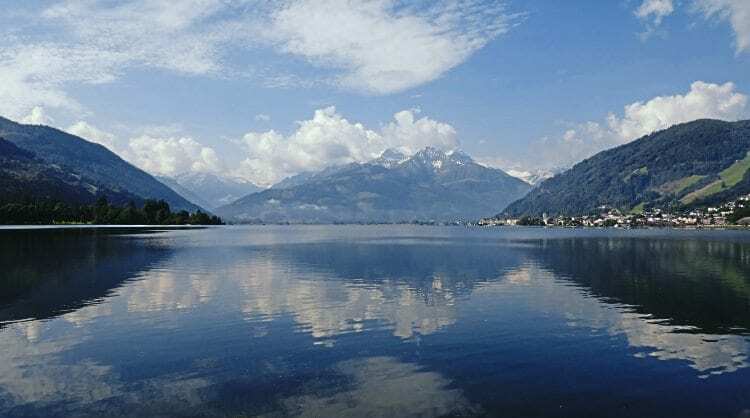 The ‘See’ of Zell am See. More autobahns next day saw us cover an easier 280 miles to Zell am See, and it didn’t start raining until after we’d put the tents up, which is always good. But the highlight for me was seeing a stork fly over us just past Munich. Zell am See is beautiful, one of Austria’s key ski resorts in season, but for us its biggest attraction was the nearest pass, the Gross Glockner. Cheer up chaps, the rain’s easing off. 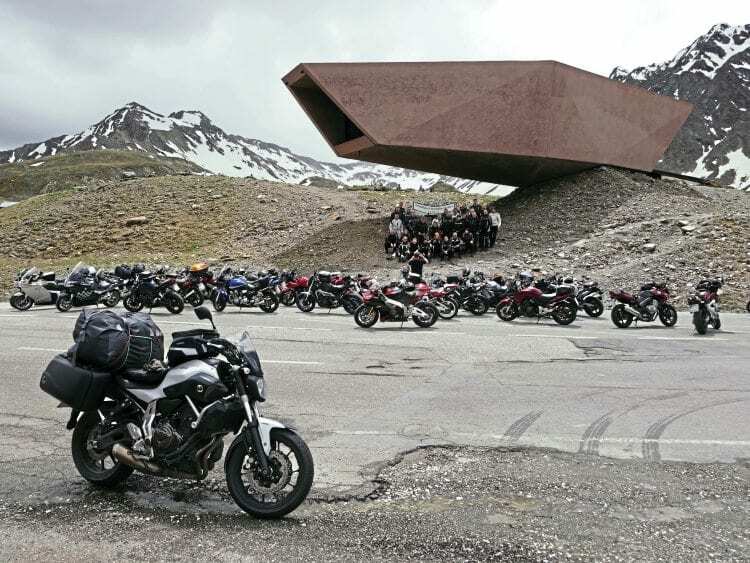 In the morning, with clear weather, this 2575m legend was all it promised, a challenging, curvy road with more motorcycles zipping past than you’d ever see in the UK. There was plenty of snow in June, though thankfully not on the road, but the experience didn’t compare with my memories from August 1967 when I was last there (on a Triumph Spitfire) – the glacier, really impressive back then, has since retreated so much that it’s nearly gone. 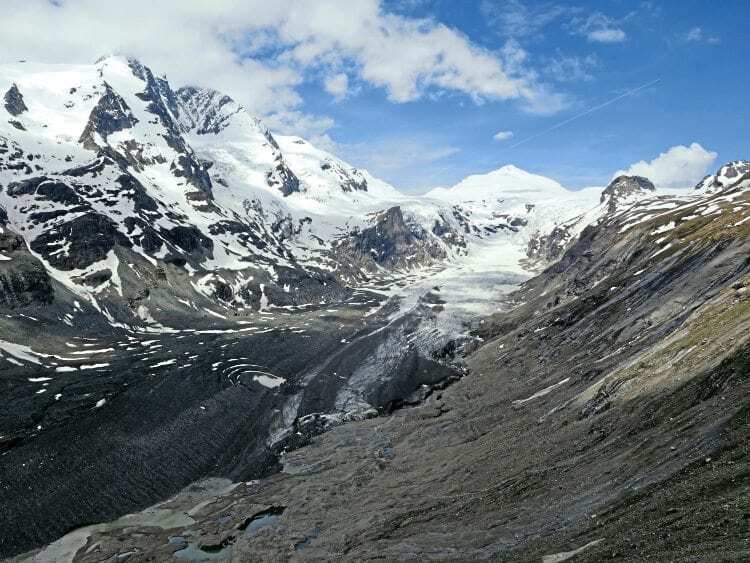 Gross Glockner glacier has radically shrunk in 40 years – climate change is real. We rode just 75 miles that day, but they had been some of the best possible, and we stopped and put the tents up in Oberdrauburg before walking into town for the supermarket and beers in the square. My well-being was saved by a cycle shop – my old Airhawk bum-saver had developed a leak, and since it’s neoprene, a modern puncture repair patch did the essential job. Next morning, by the time we’d packed up, it was raining, and the 90 miles to Bled, though not too far, weren’t a lot of fun. 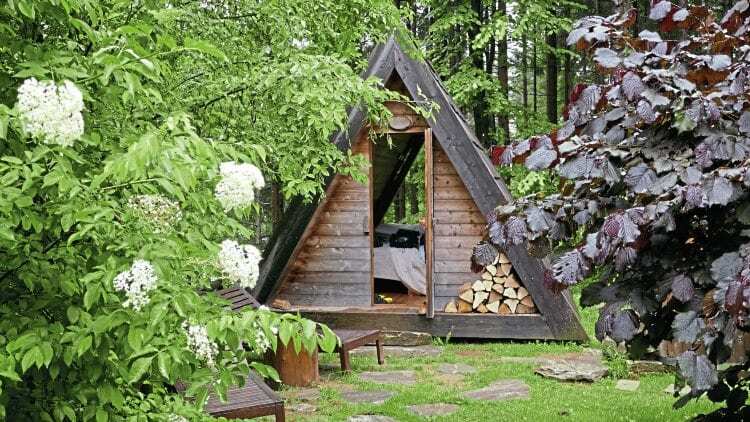 Fortunately, the campsite offered the option of a little wood cabin, which was very small indeed, but dry. Small but dry, the cabin at Bled. 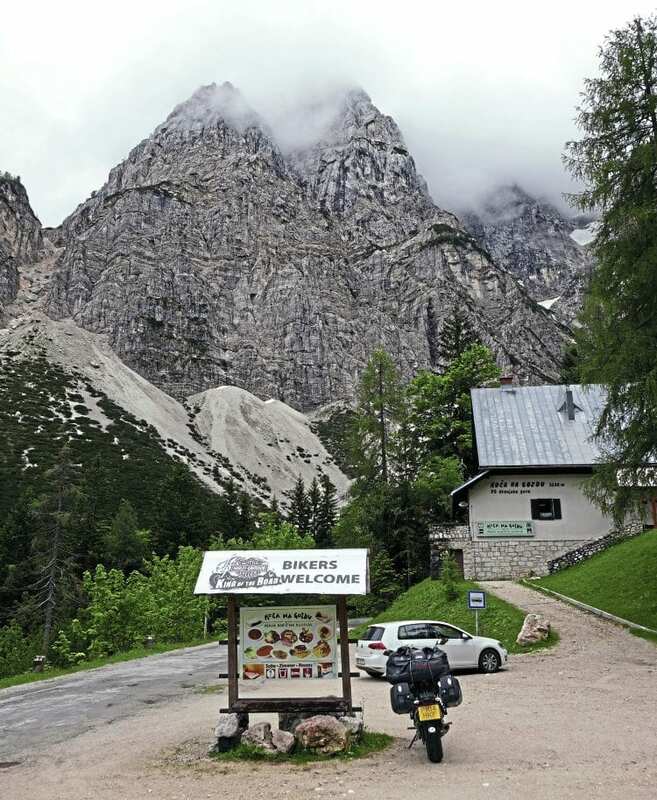 It was still raining as Thursday dawned and Geoff headed off north to Munich to meet his wife and meander back home, an early return to prepare his GS1200 Adventure for shipping to Anchorage to explore Alaska and British Columbia the following month. Now that’s real travelling. As I headed off, aiming for Cortina 170 miles away, the weather improved radically, and at Kranjska Gora I took the 1611m Vrsic Pass, with the northern side hairpins cobbled (!) to Bovec. It was quiet and beautiful, feeling more and more remote as I went on, more like the Alps and Pyrenees I remember from the 1960s. A bit of ultra-narrow back-roading got me over the border to Italy and on track for Cortina, with a super ride up into the Dolomites and, despite it being a bit late, I diverted to one of my target destinations from ’67, Lake Misurina. I’m glad I did, as the views were clear that evening. Foot of the Vrsic Pass. Motorcyclists might have passed this way before. The Cortina campsite had a restaurant, which would have been great if had it been open, but baked beans and sausages for supper wasn’t too much of a hardship. 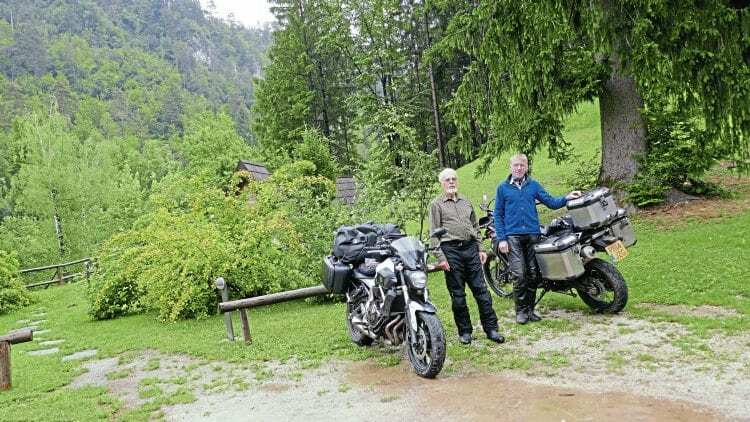 I also had a good chat with a fellow Cumbrian in the next-door tent, touring central Europe on a Yamaha Majesty 400 which he was finding ideal. 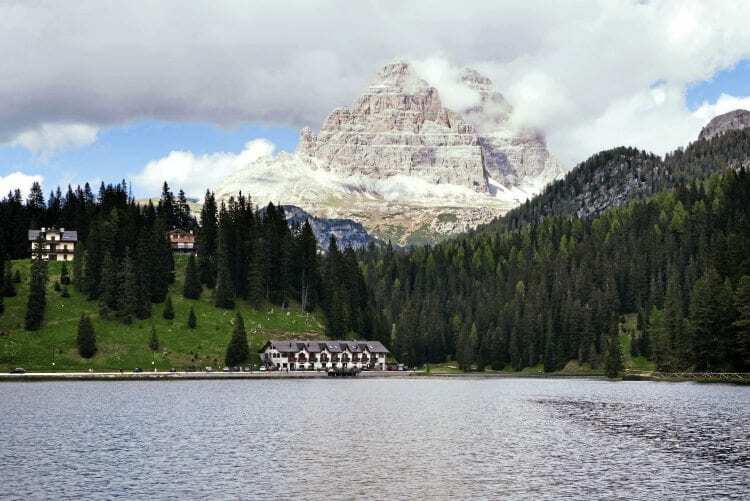 After saying goodbye to the Majesty man, next day was spent returning to Misurina, walking and photographing around the lake, then a damp campsite in the afternoon, before dining on Knorr soup, crackers, apple, cheese and wine – how I lived! Lake Misurina, with the Dolomites as a backdrop. Saturday I headed north to conquer the Jaufen (2094m) and Timmelsjoch (2509m) passes. They were absolutely spectacular in the great weather that day, and knee deep in rapid motorcyclists. But you can’t really camp on the passes so I headed down into the Otztal valley, stopping about half way down at Umhausen. It was a good, small site, proud of having the highest waterfall in the Tyrol nearby, and being below the mountains where Otzi the Iceman was found after spending 5000 years preserved in the snows. Didn’t see him, or the Neanderthal Museum there, but I did climb up to the spectacular waterfall in the morning. Welcoming party at the top of Timmelsjoch. That was a good start to a less good day, as I headed north over the perfectly horrible, very busy, Fernpass (which could have been worse – it was closed for roadworks next day) to Reutte, close to the German border. And there I stopped for the night. I’d only ridden 46 miles, but the weather had gone downhill and the rain at Ruette looked set in, so I went to Tourist Information who found me a town centre hotel with a double en suite room for only £50, including garage parking. 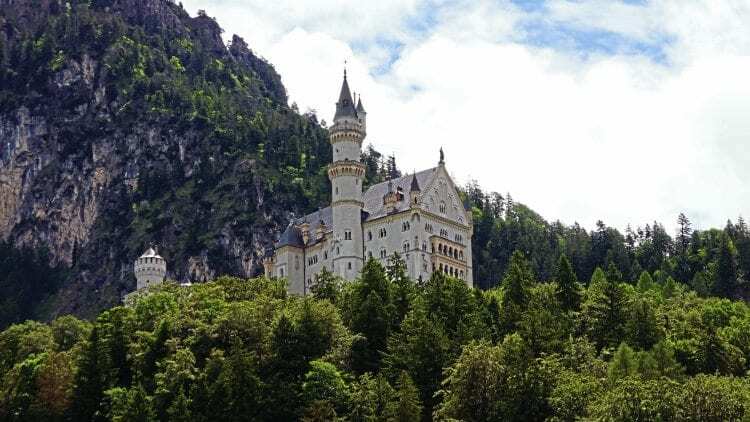 By the morning I’d decided to stay another night, giving the chance to view Mad King Ludwig’s eccentric castles nearby in Germany. What a find. 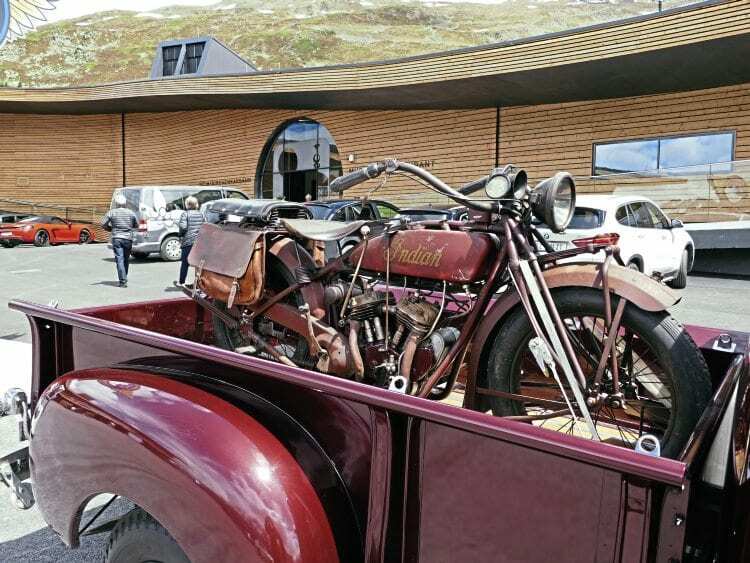 Turns out there’s a motorcycle museum at Timmelsjoch toll. Back in Austria at Plansee, the rain returned, so I brewed tea and ate cheese and crackers under someone’s deserted car port. But it soon cleared, so I left the car port for a more salubrious spot by the lake and read for an hour or so. I’d borrowed my daughter’s Kindle, and what a valuable accessory they are – book storage, battery life and most of all easy reading in the dark makes them a boon. 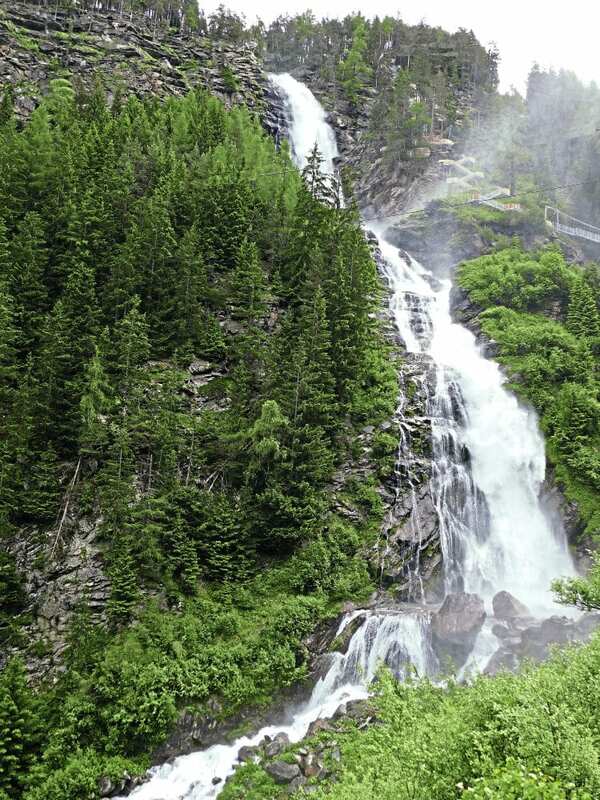 Highest waterfall in the Tyrol. One of Mad King Ludwig’s castles. Between Bingen upriver to Koblenz is probably the Rhine’s most scenic section, and I spent the next day going up one side and back down the other, stopping frequently because it’s pretty photogenic. The towns were chocolate box, the barges seriously big, the river level high. 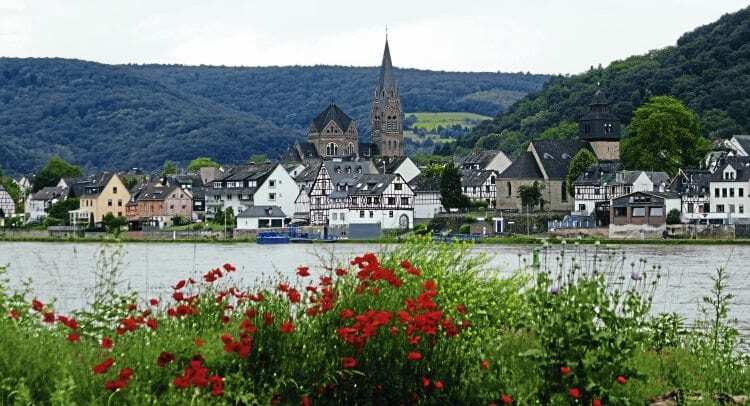 Pretty town on the Rhine. Another longish day on autobahns (265 miles) saw me at Bergen op Zoom in Holland. I had a good reason for going there, to visit a colleague from 25 years ago. As well as a good catch up, I had a proper bed to sleep in, but not before a very good meal of steak and asparagus, plus rather too much beer and wine. After a leisurely morning reminiscing, not to mention buying Belgian chocolates for my wife, I headed for the ferry. It would have been an easy 60-mile journey if I’d done my homework, but I’d not fully clocked that the terminal is way down the A15, so you must keep following Europort signs until a basic boat shape is shown (not the unmistakable ‘car inside a boat’ sign that we have). 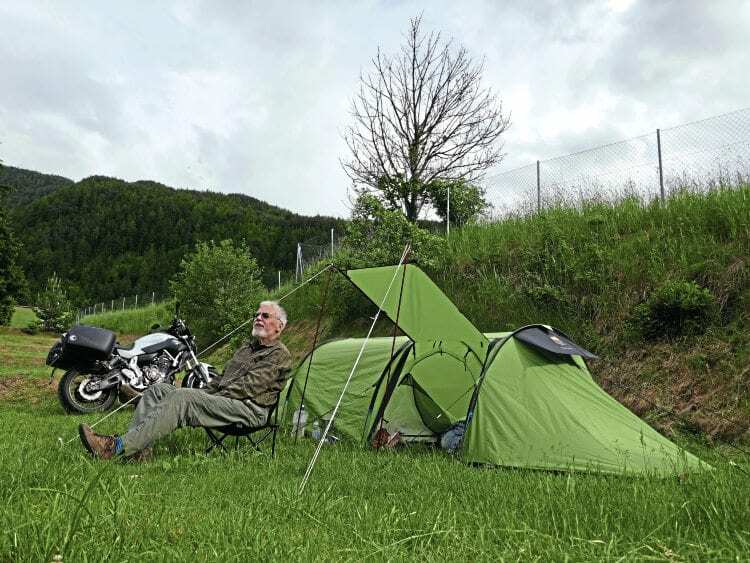 Tent, bike… and it’s not raining – no wonder Steve looks happy. I got off the motorway too early, starting back in the wrong direction, but was saved by a car-driving Dutch motorcyclist who put me right. Following his instructions, I finally spotted a sign for England and found the ferry. Beer and pizza were followed by a good night’s sleep on board, and by lunchtime next day I was back home in Kendal. So, 2350 miles, £1000 cost, and altogether a great journey, with my slightly over the hill body and mind performing well, as did the bike. Some spectacular places were visited, with good weather when I most needed it. The high passes had to be the best, of course. I wonder where my wife will let me go next year?